A Famous Gorilla Plays The Recorder, And We All May Learn Something : 13.7: Cosmos And Culture When Koko the gorilla plays tones on a recorder, she skillfully controls her breathing patterns. Commentator Barbara J. King explains why this is unexpected for a gorilla — and what it may mean for challenging ourselves to learn new skills throughout life. Koko the gorilla is world-famous for her ability to communicate with humans using phrases in American Sign Language, and for her gentle play with pet cats. 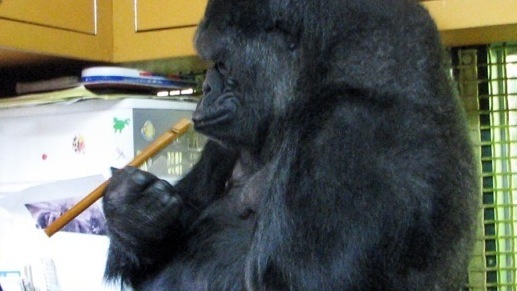 Now, a new study on Koko's play with wind instruments shows that she skillfully controls how she breathes. That's a knockout conclusion because scientists have thought that humans alone, out of all the primates, can gain skillful, voluntary control over the act of breathing. Think of blowing out candles on a birthday cake, or powerfully pushing air through a trumpet to play music. It's usually argued that skilled breathing like this originated only in the primate lineage at the point when specialized anatomy made speech possible. Koko, of course, being a gorilla, cannot speak; she has no specialized anatomy for speech. Yet she does control her breathing in unusually precise ways. I'm always fascinated when an animal does something that she is supposed to be unable to do. And I think Koko's abilities have something to tell us about how we too may "grow" skills that may not come naturally to us. Using a series of specific definitions and measurements, Perlman et al. coded videotapes of Koko playing with wind instruments like recorders, harmonicas and party favor whistles. They found 38 sequences from 17 different playing bouts to work with. The key result: When Koko plays these instruments, she adopts a pattern of breathing statistically different than her normal one. In both frequency and forcefulness, she alters her breathing in a volitional way. Though Koko is the first gorilla to demonstrate voluntary breath control, Perlman et al. don't claim she's the only nonhuman ape to do so. The zoo-living orangutan Bonnie, for instance, learned to whistle after observing her human caretakers. These captive actions challenge conclusions reached by studying fossils of extinct human ancestors. One influential paper suggests, for instance, that only late in evolutionary history did muscles and nerves allow for fine control of breathing, and thus, speech. Koko, though, is immersed in a human environment; when she plays with instruments, she is rewarded with praise and occasionally with food. Could her skills have any meaning in an evolutionary context? Perlman et al. note that free-ranging orangutans produce different sounds in different groups, suggesting a role for learning and cultural transmission. Wild chimpanzees vocalize differently according to which apes are around to listen; when they stealthily patrol their territory's boundaries, they choose to go silent. Some degree of fine breath control is certainly involved in these cases. I particularly appreciate Perlman's urging, however, that we look at this whole matter in another way: It's not as if human children show evidence of innate breath control. Rather, just like Koko does, they learn breath control through shared cultural routines with their caretakers and play partners. These cultural routines may differ across cultures. People like me, who grew up in the United States, learned as kids how to blow out those birthday candles and blow into that trumpet — and also how to hold our breath underwater. Gradually, through traditions and games shared with others, our skilled breathing comes to feel natural. This is an embodied, ecological perspective on skill emergence. Through it, we come to see that it's not only skills like language and tool-making that flourish via shared social practice, but also actions like skilled breathing that might at first be attributed wholly to biology. What a great point to keep in mind as we surround our children and, yes, our adult selves too, with ever-varied physical and mental challenges that may "grow" our skills. We may surprise ourselves by what we can learn to do — against all expectations.